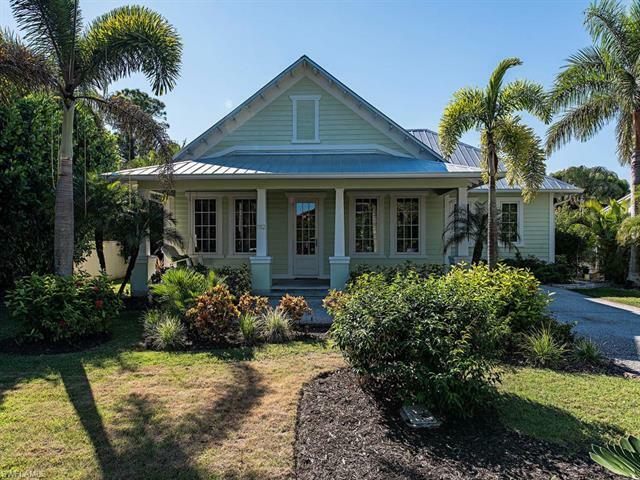 Come see your new custom-built, Key West-style home in the highly desirable Lake Park neighborhood, located less than 1 mile to Naples's white sand beaches and only 1.5 miles to the shopping and restaurants of 5th Avenue. The main home with 2 bedrooms and 2 full baths was built in 2012. The oversized entertainment kitchen invites family and friends to gather at the bar and enjoy the beautiful lake view in the back yard. In September 2018, the current owner completed a large addition that includes 695 sq. ft. under air and a 212 sq. ft. screened-in lakefront lanai. Use the extra space as your private office, mother-in-law suite, kids playroom or an extra guest suite. The 'Guest House' offers a beautiful full bathroom with a shower and extra closet space with custom built-in shelving. Custom built cabinets in all rooms and solid core doors. The hardwood floors match the cypress wood & groove wood in tray ceiling. Hurricane windows/doors throughout, plantation shutters in the main home. The yard has room for a pool and a 1car Garage in the front of the house.